If you read my blog daily, you’ll know that one of my biggest concerns for my pets is their dental health and hygiene. This should be a concern for every pet owner. Seriously, if it was you, how would it feel to go years without brushing your teeth or getting a dental check up. Well, I’ve searched high and low, and tried just about every dental bone, chew and pill around. Quite frankly I think they are all a waste of money. Then while shopping at Wiskers Holistic Pet in New York (one of my all time favorite stores) I found PetzLife Oral Care Gel. At first I was very reluctant to buy this product, simply because it was $25 for a 4oz bottle. But I figured, hey, I spend nearly $4-6 on dental chew bones that get thrown away. Let me try this. What also attracted me to the product was that you rub it on your pets’ gums and teet. This is not a bogus pill that you disolve in the water. You may apply with your fingers or with a soft toothbrush. And, its good for cats and dogs. So, I tried it on Champ giving him a daily rub for 1 month. Now I don’t often come right out and say “I love this product” but today, I am saying “I love this product.” It works. Champs teeth are noticable brighter and I certainly see less brown plaque build up. I took before and after pictures, but they were so blurry you could not see them. But, lucky for you, one can go to www.petzlife.com and see pictures and testimonials. There are no chemicals in this product at all, simply seed and herb extracts. Yes! I tasted it; not bad, very light to the tongue and had a refreshing after taste. Champ my Sheltie doesn’t seem to mind and I enjoy his fresh breath. 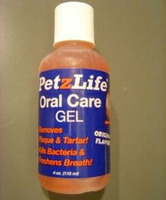 All in all, I recommend PetzLife Oral Care Gel and recommend the product as a supplement to your pets oral hygiene regime. If you’ve got a product that you think will pass the Secret Shopper test, send an email to [email protected].